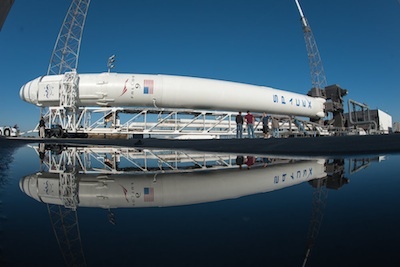 Managers are confident the same problem will not show up during Friday's launch of a Falcon 9 rocket, the first flight of the two-stage booster since the Oct. 7 launch which suffered the engine failure. "There was a material flaw that went undetected in the jacket of the Merlin engine, resulting in a breach ... causing depressurization of the combustion chamber, then the flight computer recognized that depressurization and commanded shutdown," said Gwynne Shotwell, president of SpaceX, during a press conference Thursday. Each of the nine Merlin 1C engines on the Falcon 9 first stage is shrouded in a kevlar jacket to prevent a problem with one engine affecting another in the rocket's "tic-tac-toe" first stage engine matrix. The rocket continued flying normally after the engine failure and deployed its Dragon payload in the correct orbit, but an Orbcomm communications satellite, carried as a secondary payload, was not released in the proper orbit because insufficient propellant was left in the rocket to meet safety requirements. SpaceX says the Falcon 9 rocket can lose a first stage Merlin engine at any point in flight and still reach orbit. Nine Merlin engines power the first stage, and a single Merlin engine flies on the Falcon 9's second stage. The final report on the Oct. 7 launch anomaly is not available for public release because it is under review by the U.S. State Department, according to Shotwell, who would not disclose what material was responsible for the engine failure, citing export control laws. Shotwell did not say if any changes were made to the engines on the Falcon 9 rocket set to launch Friday, but she said engineers conducted exhaustive testing to make sure the engines did not suffer from the same defect that caused the engine failure. "We did extensive analysis to understand the problem, [and] extensive assessment and testing on these particular engines," Shotwell said. "The field of science that we're talking about is called NDE - non-destructive evaluation. It's as much an art as a science, and we're certainly getting much better at it as we mature." The engine failure occurred on SpaceX's first contracted cargo mission to the International Space Station. The Falcon 9's on-board computer detected a problem with one of the rocket's nine first stage engines and commanded a shutdown 79 seconds after liftoff. The dramatic failure sent shards of debris into the rocket's exhaust plume. SpaceX says the debris came from an aerodynamic fairing covering the engine, which remained intact. Friday's launch is SpaceX's second operational - and third overall - resupply flight to the space station under a $1.6 billion contract for at least 12 unmanned cargo missions. The Falcon 9 rocket will place the privately-built Dragon spacecraft in a 124-mile by 202-mile orbit on a trajectory to reach the space station by Saturday morning. 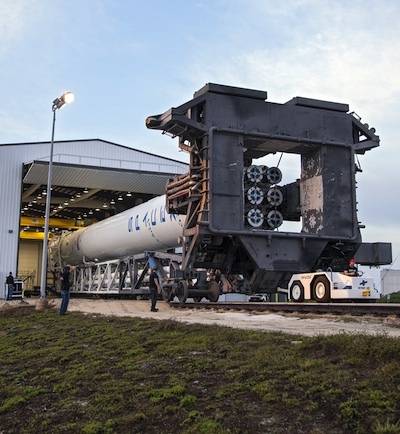 Liftoff is scheduled for 10:10 a.m. EST (1510 GMT) from Complex 40 at Cape Canaveral Air Force Station, Fla. The mission will deliver more than ton of gear to the space station, including experiments, parts to maintain the complex, food, clothing and the first shipment of cargo inside the Dragon's external trunk. "This [spacecraft] has become a very integral part of how we operate and utilize the International Space Station," said Mike Suffredini, NASA's space station program manager. Suffredini said NASA engineers participated in SpaceX's investigation into the engine mishap, and agency officials approved the return-to-flight. "Our role is to sit next to them and work with them and understand the anomaly so that we're comfortable," Suffredini said. "We have two options as the customer: we can either put our hardware on the vehicle or not. When we were done, we felt like the risk we were accepting with this flight was the same we were accepting on previous flights. We put all the hardware that we needed to fly. We didn't put any restrictions on the hardware that we needed to fly." The capsule will unfold its solar panels beginning less than 12 minutes after liftoff and open a door to the bay containing the Dragon's grapple fixture and navigation instrumentation about two-and-a-half hours into the mission. Controllers at SpaceX headquarters in Hawthorne, Calif., will program thrusters to fire on the spacecraft later Friday and early Saturday to put the Dragon on course to intersect the path of the space station. Initially using GPS navigation and then switching to laser-equipped optical aids, the Dragon will approach from behind and below the space station, ultimately reaching a point about 30 feet beneath the outpost. Astronaut Kevin Ford will snag the spaceship with the station's robotic arm at about 6:30 a.m. EST (1130 GMT) Saturday. About two hours later, the Dragon will be installed to the station's Harmony module to begin a 23-day stay at the complex. Return to Earth is scheduled for March 25 with splashdown in the Pacific Ocean west of Baja California.